Seth Troxler follows up a slew of cross-genre releases across his Soft Touch and Tuskegee labels with another offering on his no-nonsense imprint Play It Say It. 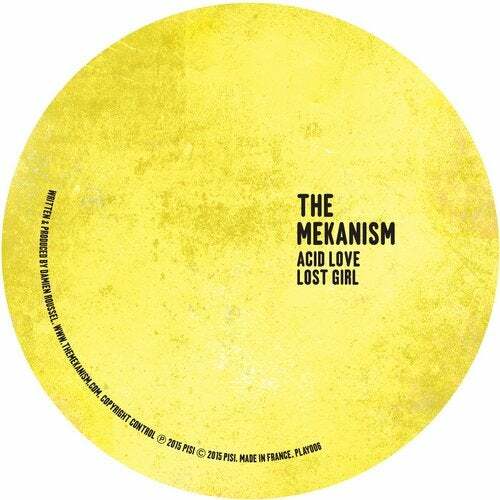 Designed to bring road-tested, high-grade club material to the fore Play It Say it has seen the likes of Clarian, Sharam and Steve Lawler build its catalogue and now, next in line is the Paris based Damien Roussel a.k.a The Mekanism. Every bit as much a stalwart of vinyl DJing as a producer The Mekanism's previous releases have touched Needwant and Los Suruba. As a DJ, he holds down a residency at Showcase in Paris as well as maintaining summertime slots at one of Ibiza's most loved underground parties Antz. All the while he has consistently rolled out the sort of taught, bumping grooves that lend him perfectly to Play It Say It and his latest offering is no exception: Tough and tumbling bass lines peppered with nifty vocal samples and flecks of acid. 'Acid Love' kicks things off with a circling bass pattern punching beneath sharp, shuffling percussion and stuttering vocal samples. 'Lost Girl' then drives a spoken word sample through a hefty bass pattern and hallucinogenic delays that are sent shimmering across the mix in a manner certain to send the floor into rapture in another fine addition to the Play It Say it series.